Cut channels for pipes or cables using the ball end bit. The profile requires the cut to be made in a single pass. To reduce stress on the bit, cut an initial groove using a straight bit matching the diameter dimension of the ball end bit. 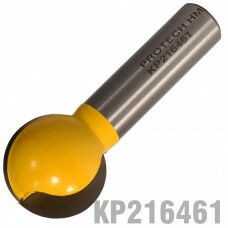 Cut channels for pipes or cables using this ball end bit. To reduce stress on the bit, cut an initial groove using a straight bit matching the width dimension of the ball end bit. Profile is used as a conduit for cables and pipes. Note: The profile requires the cut to be made in a single pass. This router bit has a 12,70 mm shank (shaft) that will fit most large routers. Please ensure that you select a router bit with a shank (shaft) size that will fit into your router collet. PRO-TECH router bits are manufactured in Taiwan. To use router bits safely (and to get the best results from your router), the router bits need to be installed properly into the router's collet. Improper installation of your bits can cause excessive chatter and could increase the likelihood that the bits will break when in use. First of all, before beginning any routing operation, check your bits to make sure that they are clean, relatively free of pitch, and most of all, sharp. If the bit is dull, chipped, is excessively burned or has any other defect, it should be sharpened or replaced before use. Most router collets have a recess (groove) that needs to click into a circlip that resides inside the collet nut. Failing to ensure that the collet "clicked" into the collet nut will cause you to struggle to remove the router bit after tightening. This could cause the collet to break or be removed by a technical repair centre. When installing the bit into the collet, do not tighten the collet with the bit "seated." Instead, insert the bit until the shank (bit shaft) reaches the bottom of the collet, then ease it out about 2 mm before tightening the collet. When the bit is tightened, there should be no less than 2/3 's of the length of the shank in the collet. If your bit has a shank that is too short, then the bit should be replaced. There are a few other safety measures to keep in mind whenever you use your router. First of all, remember to always wear appropriate safety gear as indicated above. Second, be sure to set your router to the proper speed for your router bit. Setting your router to an incorrect speed will not only affect the router's performance, but also can cause the bit to break much more easily and even cause bodily harm. The speed at which a router bit turns can be important. The typical router runs at about 22,000 rpm, which is fine for most bits. But as the diameter of the bit increases, you’ll want to slow things down. Also, before beginning any routing operation, be certain that you give the router's motor time to come up to full speed for the chosen setting. Beginning to cut before the bit is at full speed can give less than desired results. Wear a protective face shield or Safety Glasses to prevent eye and face injury. Wear ear plugs or ear muffs to protect your hearing. Use a respirator or dust mask to give protection from dust particles. Wood dust may remain in the air for hours after using power tools. Always read and follow router operator's manual instructions. Make sure that router rpm's and the bit selected match. Dress properly. Wear short sleeves, no loose fitting clothes, proper footwear and no jewellery. Tie back long hair. Always be sure the router is unplugged before replacing bits and that the switch is off before connecting the router. Be sure the router bit has completing stopped spinning before sitting the router down. Be sure bits, clamps and attachments are secure before starting up. Keep children, pets and visitors at a safe distance. Be especially cautious when working small pieces. Keep hands and fingers away from revolving bits and cutters. Do not operate routers in moist or wet areas. Always grip tool tightly and be prepared at start-up to resist the motor torque. When using a router table, make sure on/off switch is easily accessible. Learn the sound of your router and shut it off at any unfamiliar sounds or irregularities. Never start the router with the bit in contact with the material. Always feed in the proper direction, against the direction of bit rotation. Maintain equipment. Replace worn parts, discard worn-out bits and check router periodically. Clean parts with appropriate solvents. Don't operate a tool if you are tired or under the influence of medication, drugs, alcohol or while smoking. Check wood for nails, screws or loose knots before routing. Keep your mind on your work, avoid distractions, work at a comfortable pace and stop before you get tired.